In-store Intelligence by Trax and GfK is a digitized measurement solution that helps consumer durables companies better understand how shelf and store conditions impact their product and brand sales. Nowhere is omni-channel retailing more prevalent than in the consumer durables industry. As shoppers increasingly research online before purchasing products in store, the pressure on brands to consistently offer the right range, price, promotion and overall experience in stores is huge. 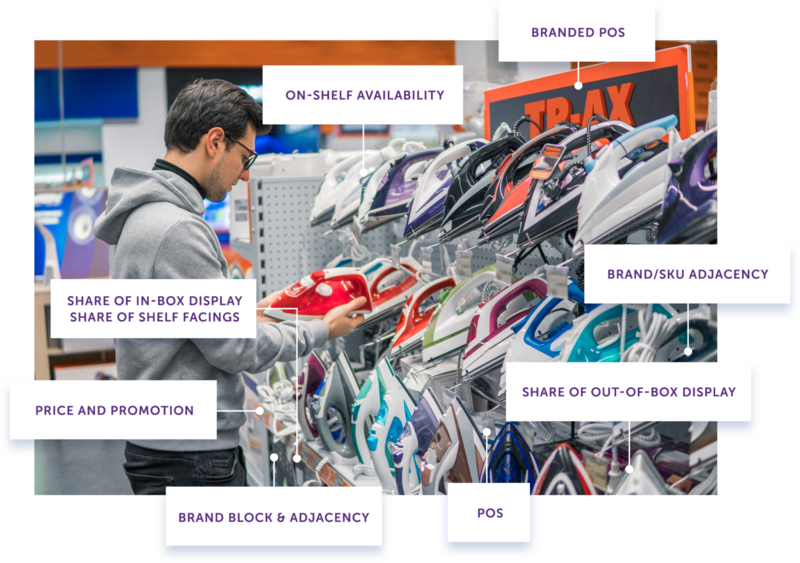 In-store Intelligence unifies Trax’s advanced computer vision platform and GfK’s proprietary retail sales data to give you a more frequent and accurate measurement of how your products perform in store. This integrated solution ensures that you constantly stay on top of in-store merchandising quality standards, to ultimately, optimize your perfect store strategy. In-store images are captured from a representative sample of stores. Trax computer vision converts images to shelf data, which are then integrated with GfK retail sales data. Monthly syndicated reports are accessible via intuitive online dashboards. The solution comprises of two components, In-store Monitoring and In-store Activation. 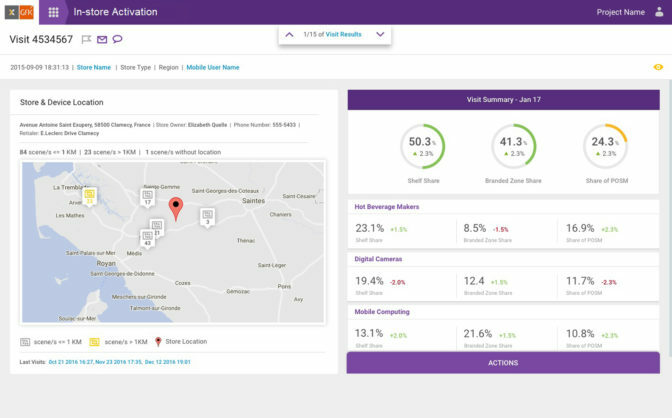 In-store Monitor delivers ongoing syndicated measurement of your brand and competitors’ in-store execution performance as well as market sales data. Identify market trends and competitor moves to gain the edge you need for commercial excellence. 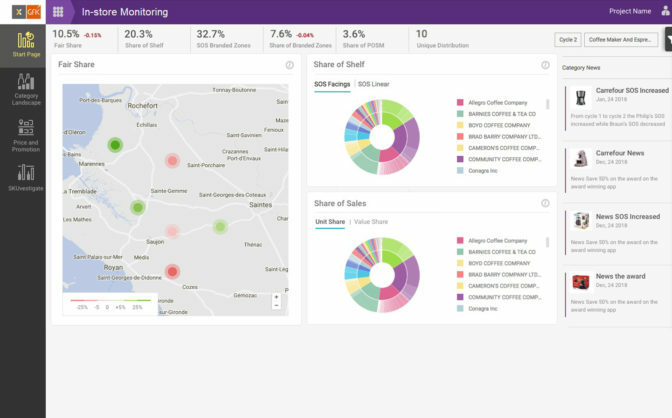 Examine how your brand fares against competition and spot category trends with a landscape view of key retail metrics like share of shelf, share of display and distribution. Analyze product prices over time and view the competitor landscape across different retailers and stores to ascertain your market gaps and opportunities. Visualize product-level performance data across store types and retailers to uncover insights on which products have the best sales rates, are turning faster, over spaced and more. Get KPIs for named stores – including picture proof of shelf execution – to activate at the most granular level and view categories and shelves the way consumers do. Identify root causes of under-performing stores and work with retailers to resolve issues with store-level execution performance data supported by real images for visual proof. Take a strategic approach to improve your merchandizing execution with analytical tools that allow you benchmark your shelf performance against competition within the category. Powered by Trax’s proprietary computer vision platform, store images are digitized right down to SKU granularity. Combined with GfK’s global category database, brand owners have seamless access to your brands and products portfolio. The combination of shelf, store and sales data can now empower brand owners with correlated store to sale metrics to fully diagnose the impact of in-store execution in driving sales uplift. Quantify the tactical impact of facings, space, positioning on shelf and brand adjacently to gather strategic insights to optimise retail space and merchandising planning strategy.